Ilham: Portrait of a President is the first international biography of a statesman who has forged one of the economic miracles of modern times. Ilham Aliyev was born in Baku in 1961 in the wake of the Berlin Crisis and months before the Cuban Missile Crisis. It was the height of the Cold War. As the son of a party stalwart, in one of the major capitals of the Soviet Union, Ilham lived a typical Soviet childhood, punctuated by propaganda and the requirement to conform. Rashid’s Legacy is the story of Dubai. Highlighting the arrival of the Maktoum family in the sheikhdom over 170 years ago, the book profiles the origins of the emirate from the beginning of its recorded history and through the leadership of a succession of family members. The book goes on to map an extraordinary story — that of the late Sheikh Rashid bin Saeed Al Maktoum, renowned as being the Father of Dubai. Father of Dubai was the first authorised biography of Sheikh Rashid bin Saeed Al Maktoum, late Ruler of Dubai, an honest attempt at understanding the man who, as Britain’s Independent newspaper commented; "led his pocket-sized Gulf emirate to unprecedented prosperity based not only on oil but also on trade". The boom describes the youthful Sheikh Rashid as a 'serious young man' who was groomed to be a leader by his dynamic mother, the remarkable Sheikha Hessa and his gentle father, Sheikh Saeed, the Dubai Ruler. Emirates: The Airline of the Future was published to coincide with the 20th anniversary of the carrier, portraying a remarkable story of corporate growth and success. Illustrated with over 300 photographs and some 80,000 words, anecdotal testimonial from those who have been part of this remarkable story has created one of the most vivid and colourful civil aviation books ever published. Rashid: Portrait of a Ruler is a story of leadership, the profound tale of a man who gave his life in the pursuit of progress. Growing up in the poverty of Arabia at the turn of a new century, the Ajman of Sheikh Rashid’s youth was a small, fishing and pearling village. As the son of the Ruler, he was born to lead during turbulent times. As Heir Apparent, the young sheikh grappled with holding together an embattled population amid the uncertainties of difficult times. This is the remarkable story of a woman’s quest to alter the course of her country’s modern history and transform the fortunes of her people. Chandrika Bandaranaike was born to one of Sri Lanka’s most distinguished families in 1945. Her father was a senior minister of the government at the time of her birth. He was later to become the Prime Minister of the country, while her mother, Sirimavo Bandaranaike, was to become the world’s first woman Prime Minister in 1961. SAQR. Fifty Years and More (The longest serving Head of State in the world and his extraordinary life) Some 59 years ago, 23-year-old Sheikh Saqr bin Mohammed Al Qasimi was placed in power of his homeland following a family conclave. The isolated sheikhdom was ravaged by poverty and starvation, while internal and external tensions were rife. The Maktoums: Legends of the Turf is the most comprehensive record of the Dubai Ruling family’s involvement in Thoroughbred racing. Profiling the great champions that have represented the Maktoums, from Ajdal to Zilzal, Legends of the Turf also highlights equestrian history and culture which underscores the Maktoum's deep affection for racing. The 70th anniversary of civil aviation in Dubai is a milestone captured by Flight Into the Future, telling this remarkable story with insight from many of those who have contributed to Dubai’s aviation pre-eminence, along with information drawn from archives around the world.The book also looks into the future and focuses on the imminent burst of aviation developments that will transform Dubai from an aviation hub to an international aviation centre. Flight into the Future is the first historical effort to record Dubai’s aviation history and also the first collective picture on the direction in which the emirate is heading in the industry. In 1993, a 70 year old veteran politician from the Soviet era was propelled from semi-retirement and back into the international spotlight at a moment that would define the survival, or not, of his nation. This book tells the story of the rise and fall and the rise again of a man and his nation. On a remarkable four occasions stretching between 1976 and 2000, Selim El-Hoss served as Prime Minister of Lebanon. 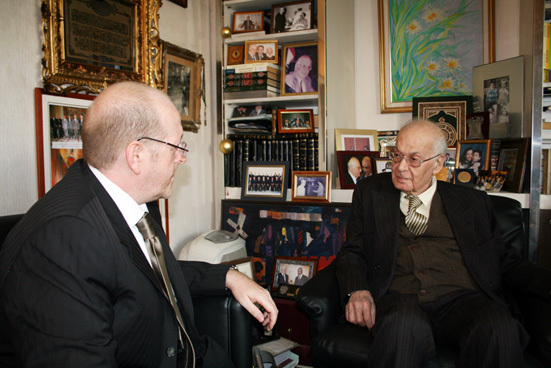 The veteran statesman met our team at his home in Beirut, offering the unique perspective of internationally respected Arab statesman, his career included the tragic Lebanese Civil War and the post-conflict period as Lebanon reeled from repeated Israeli aggressions. Still a leading member of the anti-imperialist conference Axis for Peace, El-Hoss remains an influential voice on the regional stage yet was generous enough to find more than two hours for a frank and illuminating interview. Copyright © 2019 Media Prima. All Rights Reserved.